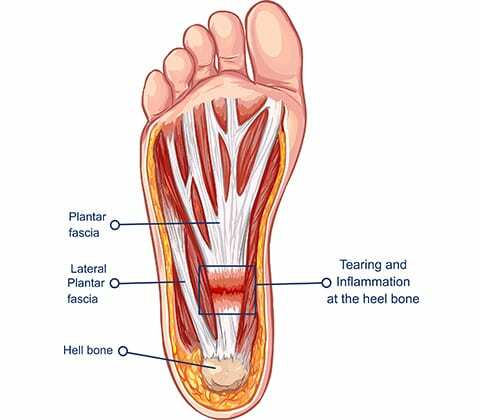 Plantar fasciitis is the inflammation or degeneration of the plantar fascia, the thick, connective tissue that runs from the heel to the ball of the foot. The condition affects two million people every year and is the third most common injury of runners. Obesity and repetitive, weight-bearing activities, such as endurance running or occupations that require prolonged standing, can lead to tearing, swelling, and pain of the plantar fascia. Tight heel cords or abnormalities of the foot, leg, and ankle also increase risk. Pain typically follows an increase in the amount or intensity of activity or a change in walking surface or footwear. It occurs in the heel, mid-arch or ball of the foot, and is worse in the morning. Physical Exam: Patients are evaluated for pain and tenderness along the plantar fascia. Ankle mobility may be limited due to a tight Achilles tendon, and it may be painful to stretch the foot. Limping to avoid pressure on the affected heel may cause hip or lower back pain. To diagnose plantar fasciitis, healthcare providers evaluate running form; flexibility and range of motion of a patient’s lower limb joints; and tightness or weakness of calf, knee, hip or core muscles. X-rays, bone scans, MRIs and ultrasound tests may indicate stress fractures, scar tissue, heel spurs, and inflammation. Rehab Management: Physical Therapy, Low-level Laser Therapy (LLLT), and Medical Acupuncture are all helpful treatments for this condition. Weight reduction, proper footwear, shoe inserts, orthotic and arch supports, taping, night splints, stretching the foot and ankle, massaging the area, and applying ice for 15-20 minute intervals also relieve pain and promote healing.